"Apollo Justice: Ace Attorney, released in Japan as Gyakuten Saiban 4 (逆転裁判4?, lit. "Turnabout Trial 4"), is a visual novel video game developed by Capcom for the Nintendo DS handheld game console. 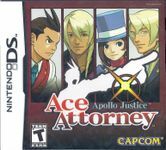 It is the fourth video game in the Ace Attorney series and was released in Japan on April 12, 2007; in North America on February 19, 2008; in Europe on May 9, 2008; and in Australia on May 22, 2008. Apollo Justice is the first game in the series that does not feature Phoenix Wright as the main protagonist, though it is not the first time a different attorney has been playable. The game is set seven years after Phoenix Wright: Ace Attorney Trials and Tribulations. Phoenix Wright has been stripped of his attorney's badge, and Apollo Justice, an up-and-coming attorney, becomes his apprentice. The gameplay of Apollo Justice can be separated into two types of situations: Investigation Mode and Courtroom Mode. Both are presented in the style of a visual novel and therefore, storyline is heavily linear, though there are often interactive interludes to the dialogue." Source: Wikipedia, "Apollo_Justice," available under the CC-BY-SA License.